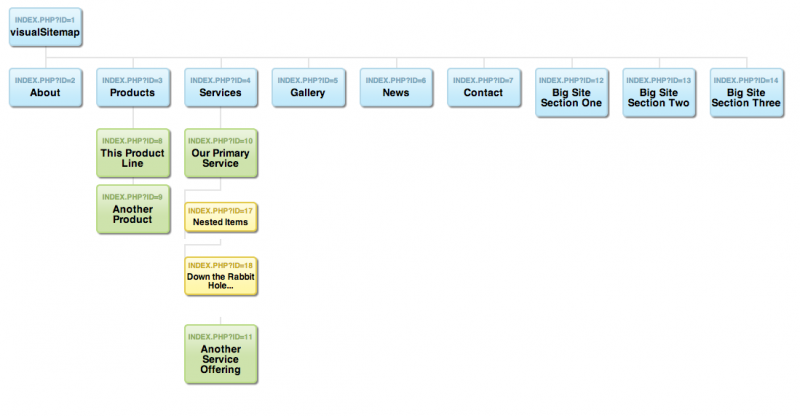 A Visual Sitemap Generator: Perfect for pre-design work and getting client signoffs. [UPDATE June 30, 2015]: I only just noticed that visualSitemap wasn't available in the Extras Installer in Revo 2.3+, so I released visualSitemap version 2. Some potentially "breaking" changes, including putting all the functionality into one Snippet, versus two. It still relies on Wayfinder—maybe in a future release I'll make that optional. Please let me know in the comments if this is important to you. visualSitemap uses the ubiquitous Wayfinder Snippet to replicate your Resource Tree in a nicely styled, HTML/CSS sitemap with clickable links. Get a jump on development as well, because the Resource Tree will already be populated with the site's architecture. He's an EE guy, but donate to show him how awesome the MODX community is—and to let him know you appreciate his work! All I did was integrate his CSS with MODX and package it using Git Package Management.